Learn about RV camping, RV travel, RV news and much more. This newsletter, now in its 16th year of continuous publication, is funded primarily through advertising and voluntary subscription contributions from our readers. Thank you! First, Happy New Year! I hope it’s a great one for you! If you are a long-time reader of this newsletter you’re likely among the most educated RVers in the USA and Canada. Alas, most of North America’s 30 million RVers have never even heard of RVtravel.com and are not privy to all the great, helpful information we’ve published each week for the last 16 years. Sadly, many are poorly informed on the finer points of buying and then using an RV. Did you watch the video we showed you last month about Jon Henderson, who guided you through his defective Thor A.C.E. motorhome? Please watch it. No RVer should have to go through what he did — dealing with one defect after another on his new RV, with basically a brush-off from both Thor and Camping World when he sought help. A few years ago, RVer David Bott wrote about a similar experience with a defective Winnebago Tour motorhome he had ordered (but rejected after Winnebago brass said they could not fix the many defects to his satisfaction). Let me pause to say that most new RVs, while they may come with design or workmanship issues, are most often easily fixed. But there are far too many poorly built RVs being sold today that are not easily fixed and, in fact, may never be fixed to the owner’s satisfaction. For far too many RV buyers it’s all about the “bling” — how an RV looks. They don’t examine it closely to determine how well it’s built. Alas, much of the blame for that poor quality goes to RV buyers themselves, who purchase RVs based almost entirely on their appearance — “the bling.” After seeing beautiful commercials by the Recreation Vehicle Industry Association (RVIA) glorifying the RVing experience, they head out to a dealer or RV show and buy a rig with only a cursory examination and little or no research beforehand. If it looks good, that’s what matters. Wrong! RV makers know this. Too often it’s “the heck with quality or workmanship that doesn’t show.” Quality costs too much: If an RV maker charges more than his competitors for a similar coach, then impulsive, uninformed buyers, with stars in their eyes, will opt for the cheapest. Manufacturer honchos — the number of which these days can be counted on one hand — don’t care as long as their products sell. Yes, there are RV makers that do care, but not enough. Incredibly, there is no national organization watching out for the interests of RVers. The Good Sam Club once cared, but under its present ownership it’s little more than a marketing tool for Camping World and its CEO Marcus Lemonis. The RVIA, which represents RV manufacturers, fights all proposed lemon laws. Its loyalty is to manufacturers, not you and me. It does a good job for those manufacturers. By that I mean a good job creating demand for their rigs — showing pretty images on TV and in magazines of RVs that, in 2016, fueled the wanderlust of 420,000 new buyers. I was reminded of the RVIA’s priorities when I stumbled upon its recent internal “reorganization statement,” which states its new, redefined goals. Nowhere is there a mention of helping or encouraging manufacturers to build better products. IN 2017 AND BEYOND, I vow to do my best to point out what I believe are flaws in the system that permit RV makers to crank out defective RVs with little recourse for consumers should they buy a lemon. And I’ll also do my best to educate brand-new RVers to look closely when buying a rig to determine how well it’s built. I’ll point you to articles, blogs and videos of RVers who got burned with lousy rigs and/or bad service. But to be fair, if you are thrilled with your RV and service after the sale, then please let me know — a good place is in the comments section below. Would you please tell your friends about this newsletter — anyone who owns an RV or is thinking of buying one — and suggest they subscribe? If you belong to an RV club, talk us up to your fellow members. There are very few RV journalists these days, online or in print, who do more than just paint a rosy picture of RVing — nothing too negative that might cost them an advertiser. My voice is tiny in the big picture, but perhaps with your assistance it can be a bit larger and maybe even help influence RV makers to pay better attention to the quality of their products, not just the quantity. Remember last issue I told you about my new handy, dandy automated RV dumping system, where I can empty my holding tanks by pushing a button inside my RV? Well, here’s an explanation of how it works. • Really? Amazon warehouses in the sky? Roadside Journal Index: Click here. •Did you miss the last RV Travel? Read it here. •Directory of ALL back issues. worth 10 cents to you? Our staff works hard to bring you a valuable newsletter every Saturday. Readers help make it possible with their voluntary subscriptions. Even a pledge of $5 a year is appreciated — that’s less than 10 cents an issue! Many readers pledge more — $10 a year is less than 20 cents an issue! Your contributions make it possible for us to write about important matters, not just fluff to make advertisers and RV industry big shots happy. Enter a voluntary subscription. Use a credit card, PayPal or mail a check. The list of latest recalls on RVs and other vehicles and/or products of interest to RVers has been released by the U.S. National Highway Transportation Safety Administration. The list includes models from Cruiser RV, Entegra, Forest River, Heartland, Keystone, Newmar, Thor and others — plus other vehicles commonly used by RVers. Is your RV or other vehicle on the list? Read more. What RV do you drive or tow? Send us a photo of your RV (and tow vehicle) with a 150-200 word description of where and how often you travel with it, and what you like or don’t like about it. Include your name(s) and hometown. We’ll post them to RVtravel.com. Send to assistant editor Diane McGovern at Diane(at)RVtravel.com . CLICK HERE to see the current issue of RV Travel Reader RVs. Reduce air drag and boost fuel efficiency — Airtab® your RV! Just peel and stick Airtabs™ to the rear sides and the rear roof of your RV coach or trailer to create swirls of air that reduce aerodynamic drag, save fuel and improve stability. Airtabs™ dramatically reduce trailer ‘fish tailing’ and crosswinds pressure to RVs from passing trucks, while improving fuel efficiency 2% – 5%! Click on the video. Click here for more information about using Airtabs™. Click here to purchase Airtabs™. THIS WEEK’S CONTEST! We have a winner. Please hold your entries and try again next time. Win this MyHeat Personal Ceramic Heater. This small personal space heater uses only 200 watts! Great for anyone who’s always cold. Put it by your feet or on your desk to keep toasty warm. Keeps a small RV bathroom warm, too. The winner will be chosen randomly out of all correct entries received by noon (Pacific), Sunday. The question: Wilma Flintstone’s best friend is Betty Rubble, wife of Barney. In the fourth season of the Flintstones cartoon series, Barney and Betty adopt a son. What’s his name? Answer is below. Email your answer to RVcontests (at) gmail.com. We can only ship prizes to addresses with a U.S. Zip Code. Only one entry per household. ***New contest rule: All entries must include your mailing address and telephone number. *** Contest ends Sunday at noon (Pacific), at which time a winner will be selected using Random.org. We’ll let you know if you win. The winner will have 24 hours to respond or forfeit the prize. If that happens, we’ll hold the prize for another time. While the final tally isn’t in, the Recreation Vehicle Industry Association says its projections for 2016 movement of new RVs from factories to dealers was wrong. Instead of the expected 395,000 units, it appears at least 420,000 new RVs made the trip. And 2017 looks to be a banner year, with the group suggesting as many as 438,000 new RVs will be rolled out to sellers. Grand Canyon National Park got plenty of visits this year – 6 million, in fact – making it the second year in a row for record visitation. More than 5.5 million descended on the Arizona landmark in 2015. The National Park Service (NPS) has proposed revisions to regulations that address smoking in national parks. The proposed revisions would change the regulation that defines smoking to include the use of electronic cigarettes and other electronic nicotine delivery systems (ENDS). Call it volunteer vigor. Florida has 174 state parks, trails and historic sites, and all of them use volunteer power to keep them going. How much? In the 2015-2016 fiscal year, nearly 1.3 million hours of work came from 29,275 volunteers. According to a state spokesman, that labor was worth nearly $30 million. Source: Northwest Florida Daily News. When is a non-Camping World RV dealership really a Camping World dealership? When it’s part of Camping World’s new sneaky strategy called “side by side.” The first is in Wheat Ridge, Colo., where Camping World is buying out Ketelsen Campers of Colorado. In the new move, the giant will buy up RV dealers in close proximity to existing Camping World stores, and operate the newly acquired outfit under its existing name. In the case in Wheat Ridge, Ketelsen Campers is a mere 2.5 miles away from the existing CW store. They also signed a deal on January 3 to acquire RV World of Georgia in this “side by side” business strategy. Georgia State Parks are offering an off-season peach-of-a-deal to RVers: half-off camping rates Sunday through Thursday at select state parks. Use the promo code “WinterPromo16” to make reservations through January 31. You’ll need to stay a minimum of two nights, and the offer isn’t good at Crooked River, Skidaway Island, Reed Bingham, Fort McAllister and Laura S. Walker parks. Stanley Black & Decker Inc., has purchased the 90-year-old Craftsman brand from Sears Holdings Inc. The $900 million acquisition will add Sears’ famous wrenches, tool chests and signature lifetime warranty to its sprawling portfolio that already includes Stanley’s familiar black-and-yellow tools, Mac Tools for auto mechanics, and the Black & Decker, DeWalt, Lenox and Irwin brands. Another independent RV manufacturer, Renegade RV – named such, because in 1997 the builders were refused entry at the Recreation Vehicle Industry Association annual convention because they weren’t members – is apparently no longer renegade nor independent. Renegade RV has been taken over by REV Group, which now adds the firm to other “trophies” including names like Fleetwood, Holiday Rambler and Monaco. Give Dyers a try on your next purchase of RV parts or accessories. Large selection, great service, low prices and fast shipping. Visit our website. Ivins, Utah, will soon have a new RV park on Highway 91 – but it wasn’t easy getting it. The city council approved a zoning change to allow for the park but only after a couple of obstacles were resolved. One was a feud between the property owner/developer and the next-door neighbor, finally settled with an agreed 180-foot buffer zone. The other, arguments from locals that cyclists would be at risk from “potentially dangerous RV traffic,” should the park be allowed. A review of accidents of that stretch of the highway showed RVs had never been involved. British Columbia provincial park officials say reservation system changes are now in place. To “enhance fair access for everyone,” the old mid-March opening reservation day is gone – now sites can only be reserved up to four months in advance. Restrictions are in place to prevent people from overbooking days around long holiday weekends by making a reservation, then changing arrival dates to their favor. Some popular campgrounds will see a new cap of seven-day stays. Across America, national wildlife refuges offer unparalleled opportunities to experience the great outdoors amid scenic beauty. From Hawaii to Texas and Indiana to Delaware, 31 refuges that normally charge entrance fees will offer free admission on these days in 2017: January 16 – Martin Luther King, Jr. Day; February 20 – Presidents’ Day; September 30 – National Public Lands Day; October 8 – First Sunday of National Wildlife Refuge Week; November 11-12 – Veterans Day weekend. The 31 refuges charge admission ranging from $3 to $8 per vehicle to help fund their recreation-related projects. The 2017 entrance fee waiver does not cover concessionaire or permit fees for some activities such as hunting, fishing or special tours. Indiana wildlife fanciers are rejoicing: Bald eagle C43, the oldest known wild bald eagle in the state, has been spotted at Lake Monroe, near Bloomington. C43 came to the state in 1988 from Alaska and was released with hopes she would nest there. At 28 years, she may be one of the top-10 oldest wild bald eagles in the U.S. Sales Pad, a software company that provides programs to improve business efficiency, filed suit Dec. 19 alleging fraud against Marcus Lemonis, CEO and chairman of Camping World and the Good Sam Club. Meanwhile, attorneys for RV dealer Gigi Stetler apparently have had enough in waiting for Lemonis to present himself for a deposition in an ongoing lawsuit that claims that Camping World and several other firms conspired against her and her Florida dealership. Read more. How many of us would dream of an RV tour taking us from coast to coast across Canada? Free of charge? Well, no lucky stiff will have the chance, but a red couch will soon do it in honor of Canada’s 150th anniversary. Yep, the Canada 150 Red Couch Tour will chauffeur a red, weather-resistant couch from St. John’s, Newfoundland, west to Victoria, British Columbia. The purpose of said Red Couch Tour is to build a Canadian history prospective, wherein photos and videos of folks sitting on the couch will be built into a sort of living history. Not everyone thinks the expense, $155,000 (Canadian), is a great use of taxpayer money, but the show goes on. throughout the week at RVbusiness.com. One photo explains why the old truckers’ admonition applies to RVs: “Snow? Go slow. Ice? No go!” The woman towing this travel trailer on ice on Interstate 69 near Tekonsha, Mich., had the misfortune of having a semi-truck breeze past her. That’s all it took to cause a loss of control on the slick pavement, with the results involving her being extricated from her tow vehicle after the roll-over tossed her pickup in front of the passing semi-truck. Details here. Here’s some advice: If you’re wanted by police and need an RV, steal one that’s a little less conspicuous. Luna County, N.M., police arrested Shane Amel Lynn, 37, after reports came in about “suspicious vehicles” on ranch land there. It’s not every day you spot a Winnebago Vectra Freightliner motorhome in the middle of nowhere. Now Lynn is charged with stealing the spendy coach, on top of outstanding warrants for kidnapping and aggravated assault. Turns out he was also wanted on escape charges from Washington state. Chuck Woodbury, RVtravel.com editor, presents his thoughts on an “internal reorganization” statement from the Recreation Vehicle Industry Association (RVIA), which represents the RV industry, mostly manufacturers of recreational vehicles. Let us know what you think about the new or redefined goals for the organization. Do you agree that they’re missing a very important concern? Read more. Doug Swarts, the inventor of the Drain Master electric sewer valve, explains how the system permits an RVer to dump his or her holding tanks remotely from inside the RV. This is the same system that RVtravel.com editor Chuck Woodbury installed in his motorhome. Watch the video. As RVs come out of the “dark ages” and flow with the use of modern technology, it gets easier for us, including the use of an automatic transfer switch (ATS). But beware: Even with an ATS to make living with your RV generator oh-so-much easier, there are issues that you need to take care with – some that can cost you loads of money. Learn more. RV waste management expert Doug Swarts of Drainmaster.com explains why RVers should not only keep their black (sewer) tanks closed when hooked up to utilities, but their gray water tanks as well. Watch the video. Not very many of us like the sound of a generator — it’s regarded by most as a necessary evil. In some areas, there are significant restrictions on generator-use times. But if you have to have 110 volts, what else can you do? Fortunately, for those brief “I just need a little” times, there’s a relatively easy and affordable answer. Find out here. 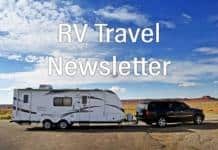 Chris Dougherty, certified RV technician, received a letter from a reader while he was serving as RVtravel.com’s technical editor regarding a sticky slideout. The reader complained that the slideout moaned and had a hard time retracting. He wondered what he could do in case the slide didn’t come in at all. Read Chris’ response. If you’re the proud owner of a well-loved older RV, you’ll have run across the old “orphan parts” issue because the part isn’t stocked anymore or the company doesn’t exist anymore. Here’s an easy and inexpensive fix if your fridge door has a tendency to pop open and spill its contents and you can’t find the original replacement part. Read more. With membership in Harvest Hosts® you can stay overnight at 500 wineries, farms and attractions across North America. Harvest Hosts offers an exciting alternative to traditional overnight stops where you can meet interesting people and learn about their lifestyle. Learn more at the Harvest Hosts website, or watch an interview with the founders by RVtravel.com editor Chuck Woodbury. The Family Motor Coach Association gathering March 7 through 10 in Chandler, Ariz., will be preceded by its inaugural RV Basics course, March 5 and 6, at Rawhide Western Town and Event Center. Led by several well-known RV experts, including Gary Bunzer, Mac McCoy and Walter Cannon, the sessions will help to get beginning RVers off to a great start or serve as a refresher course for current RVers. Learn more. Rich “The Wanderman,” our resident flashlight addict, has found a new gizmo which makes him very happy! It’s a flat, clear, LED light with an attached black handle. It was so unusual (and 90 percent off/$1.49) that he couldn’t resist buying it at Target, and now he wishes he had purchased a few more. Find out why. Did you know you can stay overnight at approximately 1,000 Elk Lodge RV parks across the USA and Canada? Sometimes it’s dry camping, but other times it can be partial or full hookups. In this short video, Elks member Jim O’Briant of OvernightRVparking.com explains how Elks camping works. Watch the video. As winter digs in, snowbirds in the Southwest are reveling in 60-, even 70-degree days. It’s time for adventuring – and you’ll find some of the most interesting “mountain ranges” in the southwest corner of Arizona in the form of the Harquahalas. The whole area is prime territory for adventurous boondockers, offering much to see and do. Read more. Ever thought of having your gray and black holding tanks power flushed? “Why?” To get out all the nasty crud that accumulates over time! All that crud can cause a lot of problems including faulty sensor readings, not to mention producing foul odors that enter your RV! In this video, see what happens when RVer David Bott’s tanks are flushed out with a whopping force of 4,000 PSI of water pressure. Watch the video. Keystone RV Company is recalling 1,582 model year 2017 Keystone Carbon and Raptor fifth wheel trailers, and 2016-2017 Fuzion and Dutchmen Voltage fifth wheel trailers. The affected vehicles have rear cargo door hinges with welds on the hinge pin and hinge plate that may be insufficient, and as a result, the top of the door may swing down with more force than normal. If the door does not open as expected, there would be an increased risk of injury to those in the door’s path. Read more. Thor Motor Coach (TMC) is recalling 209 model year 2016-2017 Outlaw motorhomes, models 37BG, 37LS, 37RB, 38RE and 38RF, manufactured January 13, 2016, to December 8, 2016. The affected vehicles have rear cargo door hinges with welds that may be inadequate for securing the hinge pin to the hinge plate. Learn more. The new TireTraker™ TT-500 is the most innovative & user friendly TPMS on the market with an unprecedented “Lifetime Warranty,” the only TPMS company in the industry to do so. The TT-500 features a larger, easier to read display, continuous pressure & temperature monitoring, automatic update, & monitoring up to 22 tires on your motorhome, trailer & tow vehicle from 0-232 psi ! Seven day per week sales & technical support & over 12 years of experience. List price (4 tires) $389. Our price only $289. SAVE $100! (Additional Sensors $35 each). Learn more or order. Read testimonials. 1904 — Henry Ford sets speed record (91.37 mph). 1908 — Theodore Roosevelt makes Grand Canyon a national monument. 1927 — Harlem Globetrotters play their first game. 1946 — Elvis Presley receives his first guitar (at age 11). 1946 — First meeting of the United Nations. 1962 — Comedian Ernie Kovacs dies in car crash. 1976 — “Convoy,” by C.W. McCall, is #1 on the U.S. pop charts. 2007 — Steve Jobs debuts the iPhone. For the first time with full-color photographs, here are 1,000 compelling, essential, offbeat, utterly unforgettable places to see in North America. Pristine beaches & national parks, world-class and specialty museums & festivals, salmon-rich rivers, scenic byways & much more. Published in 2016. Learn more or order. Here is an RV club we like. We hope you do, too! Traveling Supremes is an independent, non-profit RV destination club. The club is open to all conventional, self-contained recreation vehicles. They enjoy traveling to interesting places, seeing new sights, and developing/continuing friendships with fellow RVers, and welcome new members to the club. Check out our Directory of RV Clubs and Organizations. Life would be really funny if it weren’t happening to me. Seen on a billboard for a restaurant outside Nazareth, Pa.: “Wine and Steak. Because nobody celebrates anything with tofu.” Thanks to Al Aslakson for sending this in (awhile ago). See which Walmarts in the USA do NOT allow overnight RV stays. This Dirt Devil Simpli-Stick Lightweight Bagless Stick Vacuum is compact and it works great. Plus it converts to a hand vacuum in a snap! It’s the vacuum of choice in the RV Travel motorhome. Weighs less than 4 pounds. Learn more or order for about $20. Here are a few ideas for road trips for this year, in case you’re still in the planning stages. These include national parks, historic places and culinary destinations. How about the Blackhawk Chocolate Trail in Illinois, or retrace the path of Kevin Costner and James Earl Jones in “Field of Dreams” from Boston to Dyersville, Iowa. Some interesting ideas here. From Cheapism.com and msn.com. Well-stocked RV kitchen. Equipment and pantry staples for the well-stocked galley kitchen, tips and advice, and, of course, lots of recipes. From allrecipes.com. Here are more than 30 of the best things in Florida to experience and explore on a budget. Included are the best city for retirees, best RV park, best flea market, best dog-friendly vacation, spookiest graveyard, and lots more. Even if you’ve visited Florida many times or maybe live there, we’ll bet you’ll find some new places to visit on this list. From Cheapism.com and msn.com. Here is our “master list” of more than 700 websites we like, which we have compiled over the years. Space heater uses only 200 watts! It’s hard to believe that an electric space heater could use a mere 200 watts — the same as a couple of light bulbs —a fraction of other space heaters. And this one really works! It’s meant to heat a nearby person, not a room. Put it on your desk or at your feet. It’s perfect for the RVer who’s “always cold.” For about $19, this is a winner. Click the video by RVtravel.com editor Chuck Woodbury. Or order at Amazon.com. • Texas Lakeside RV Resort in Port Lavaca, Texas is a man-made tropical paradise. • Watch this video to see what’s new in camping technology. • Protecting your tires from harmful UV rays can significantly extend their longevity. Protect yourself and others from sharp edges of RV slideouts! Cut your head just once on the corner of a sharp RV slideout and you’ll race out to buy a set of these so it never happens again! Camco’s Black RV Slide-Out Corner Guards offer a simple solution to the danger posed by sharp corners on RV slideouts. Simply place them on each exterior corner of the slide to provide a cushion zone. They’re made of advanced UV-stabilized resin for long life. Easy to install and no tools are required. Learn more or order. Read the RV Shrink’s response. Can’t get enough of the Shrink? Read his new eBook: Dr. R.V. Shrink: Everything you ever wanted to know about the RV Lifestyle but were afraid to ask or check out his other e-books. Just put your hands beneath the dispenser, and presto, just the right amount of soap is dispensed. Never pump again! Hayden’s soap dispenser uses Infrared Technology to automatically and quickly detect your hand. Uses 3 AAA batteries. Learn more or order. Most U.S. states and Canadian provinces have their own laws on the requirement for brakes on a towed trailer. The word “trailer” also applies to a vehicle being towed behind a motorhome. These laws are normally based on the amount of weight being towed. One problem with this is that it might be legal to tow a 2,000-pound trailer with no brakes in the state where you live, but as soon as you cross the state line of a bordering state it is illegal to tow the same trailer without brakes. Add to this your insurance company may not cover you in the event of an accident involving a trailer with no braking system. Again, the most important reason is for your safety and the safety of others. Mark Polk is the owner of RV Education 101, the premiere source of educational DVDs about buying, maintaining and using an RV. Learn more. Keep rodents out of your RV! The overwhelmingly positive reviews on this make it a best bet for keeping your RV rodent-free. This is the only plant-based rodent repellent registered for inside use by the EPA. It effectively repels rodents up to 100 days with a “woodsy” scent that’s pleasant to humans but offensive to rodents. It’s safe around kids and pets so no safety warning is required. 98% biodegradable. Tested and endorsed by the Good Sam Club. Learn more or order. Other rodent repellent products at Amazon. Regular unleaded gasoline: $2.31 (on Dec. 26). Change from week before: Up 5 cents; Change from year before: Up 28 cents. $2.38 (on Jan. 2). Change from week before: Up 7 cents; Change from year before: Up 35 cents. Diesel: $2.54 (on Dec. 26). Change from week before: Up 1 cent; Change from year before: Up 31 cents. $2.59 (on Jan. 2). Change from week before: Up 5 cents; Change from year before: Up 38 cents. Endorsed by Roger Marble of RVtireSafety.com! The Accutire MS-4021B digital tire pressure gauge has an easy-to-read LCD display that provides pressure readings from 5-150 PSI. It’s ergonomically designed with an angled head and a rubber-coated easy-grip handle. If you forget to turn off the gauge, don’t worry, it will automatically shut off. The included lithium battery never needs to be recharged or replaced. And all this for less than $13! Learn more or order. It’s party time, so take a dip. Entertain in the campground the easy way by putting out a hot dip and rafts of dippers. Do a little chopping and mashing and this dip is ready to heat. It’s just the ticket for potlucks, tailgating and infield camping parties. Get the recipe. for a full-time home base? The full-time lifestyle gives you the unique opportunity to choose any state to call “home.” But there are many factors to consider; a state with the lowest state income tax is not always the best option. This guide provides a wealth of valuable information to help you select the state where you will benefit the most. Learn more or order. Grease, oil and road dust build up on the engine and transmission, making them run hotter. The grime itself usually doesn’t burn, but if combined with a fuel leak or short-circuited wire, a fire could start. Keep your coach’s underpinnings clean, and it will run cooler, more economically and longer. Editor’s note: Choose from a wide selection of fire extinguishers at Amazon. Barney and Betty’s adopted son was named Bamm-Bamm. Every RV refrigerator should have one of these! This small refrigerator fan from Valterra Products will help keep the food in your RV fridge cool and from spoiling. It cuts down initial cool-down time by 50 percent. Runs for more than 30 days on 2 D batteries. Don’t leave home without this! Learn more or order from Amazon.com. Every month turn your RV “powder-type” fire extinguisher upside down and shake it hard, even tap the bottom of it with a screwdriver handle. The constant shaking and rattling of going down the road can compact the dry chemical in the device, and you need to loosen it up to ensure it comes out when you need it. Keep a can or bottle of good-quality window cleaner within easy reach when you stop to fuel up. Before starting to pump fuel, spray your windshield liberally with the window cleaner. Let it sit while fueling and then use the “usually” available squeegee to easily remove the bug guts. The cleaner virtually dissolves and releases the bug guts from the glass and it saves a whole lot of scrubbing. Our thanks to George Bliss! Working in the RV galley generates all kinds of small waste particles. If they go down the sink drain, they can form a “stink generator,” and they can foul up your tank level probes. Get the appropriately sized stainless steel sink drain screen at the hardware store. Clean it out frequently — by tossing the contents in the trash, not down the drain. Do you have a Quick Tip? Send it to Diane (at) RVtravel.com and you just might see it here! If you don’t take care of your slideout you’re asking for problems including dangerous, costly water damage. This rubber seal lubricant from Thetford prevents fading, cracking and deterioration. It cleans, conditions and shines, keeping seals flexible and protected from sunlight destruction. It is also useful on door seals and window seals. It’s a mineral oil product and also acts as a lubricant. Learn more or order. Okay to store RV antifreeze in unused fresh water tank? Tired of stuff moving around in your RV fridge after a day of driving? Maybe a carton of milk has fallen out on the floor one too many times? Here’s the solution. Camco’s RV Double Refrigerator Bar is designed to keep order in your RV fridge during travel. It’s spring loaded to keep items in place. The bar extends from 16″ to 28″. And the good part is the price tag: about $5! (The RVtravel.com staff uses a pair of these in its RV!) Learn more or order. “I read once again in this newsletter the admonition to not put anything down the RV toilet other than RV toilet paper and organic matter. My question: What about those who of necessity must occasionally use Tucks for medicinal reasons? Surely with all the baby boomers out there RVing someone can address this issue.” Read Doug’s response. Essential equipment for many RVers! This best-selling product reduces bad taste, odor, chlorine and sediment in drinking water with a 100-micron fiber filter. Its durable in-line, exterior mount filter has a wider body to increase flow. Use it at your campsite to keep sediment out of your RV water tank and to improve the taste and smell of your drinking water for a whole season. Many RVers consider this essential equipment. Learn more or order at a big discount. Rock and roll is here to stay — but those song lyrics shouldn’t define how your 5th wheel or travel trailer behaves in your campsite. The Valterra RV Stabilizer is your stabilization solution. This simple and effective stabilizer creates a rock-solid foundation for your fifth wheel, class “C” motorhome, toy hauler or travel trailer. It’s durable, simple and convenient — and sets up in minutes with no tools required. Read more. Kenyon International introduced its new SilKEN® Grill, ideal for use in RVs with limited storage area. The SilKEN Grill features a collapsible silicone lid that stays cool to the touch.The lid and other parts of the grill detach for quick and easy cleaning. The grill is smokeless and flameless, an important safety feature for consumers looking to use the grill indoors. Learn more. JUST PUBLISHED. With more than 12,500 locations listed across the USA and Canada, the Good Sam RV Travel & Savings Guide is the only print directory of RV parks and campgrounds. The 2017 edition features an expert rating system with all evaluations. Park listings include amenities, services, restrictions, rates, contact info, Good Sam discount locations, hundreds of dollars’ worth of Camping World savings and pages of helpful information. Learn more or order. See the list of all upcoming RV shows. Diesel Kleen + Cetane Boost is a highly rated, technologically advanced, diesel engine performance improver that cleans injectors, boosts cetane and lubricates fuel injection components. The maximum horsepower formula restores lost power, smooths rough-running engines and improves fuel economy up to 8 percent. Learn more or order. In 1934, a gallon of gasoline cost 14.9 cents. That’s the price displayed today in front of the beautifully restored Richfield gas station at 5th and Glenn in Coalinga, Calif. It was built in 1934 and later restored and moved in 2004 to its present location. A fence surrounds it. A block away, at the R.C. Baker Museum, ask to have the gate opened: If someone’s available, they’ll oblige you. And, no, you can’t fill up for 14.9 cents a gallon. Google Street View. NEW FOR 2017! Essential for big RVs! If you drive a big RV — extra long or extra tall — then this truck driver’s road atlas will be a huge help in knowing where you can drive without encountering a low bridge or getting stuck hanging over a cliff. This is an essential aid even if you have a GPS! Coverage: United States, Canada, and Mexico. Learn more or order. “This ‘telephone’ has too many shortcomings to be seriously considered as a means of communication. The device is inherently of no value to us.” —Western Union internal memo, 1876. DampRid FG50T Hi-Capacity Moisture Absorber, 4-Pound Tub eliminates musty odors in RVs and other spaces, protecting them from moisture damage for up to 60 days in areas up to 1000 square feet, and up to 6 months in a 250-square-foot area. Don’t let your rig get damaged from moisture this winter. Learn more or order. Gary Bunzer, the RV Doctor, shows you how to adjust the flame on your RV water heater so that it runs with maximum efficiency. Watch the video. RV Travel editor explains how an RVer can fish without a state license across the country. Watch the video. Here, in about three minutes, is a terrific explanation of your fresh water system, both when hooked up or when using your holding tank and a water pump. Watch the video. HOW TO WATCH YOUTUBE VIDEOS USING VERY LITTLE BANDWIDTH. More than 500 great videos about RVing! Prepare more complicated meals when you have full hookups. It’s easy to clean up afterward because you have plenty of water and no worry about holding tank limits. Consider making a double portion and freeze half for a future meal. When boondocking, keep recipes simple and use paper plates which you can burn later to start your campfire. Don’t toss away good batteries! Most RVers rely on battery-powered devices while on the road, whether flashlights, radios or cameras. But sometimes you just can’t tell how much life a battery has remaining so you toss it to “be sure.” This small, inexpensive tester will alert you in an instant to the condition of a battery, saving you money from needlessly tossing ones with plenty of remaining life! Works on AA, AAA, C, D, 9V and button-type batteries. Learn more or order. TODAY’S DEALS AT AMAZON.COM. Click. Editor and Publisher: Chuck Woodbury. Assistant editor: Diane McGovern. Contributing editor: Russ De Maris. Contributing writers: Greg Illes, Bob Difley, Richard Miller, Richard Mallery, Janet Groene, Doug Swarts, Roger Marble, Julianne Crane and Chris Guld. 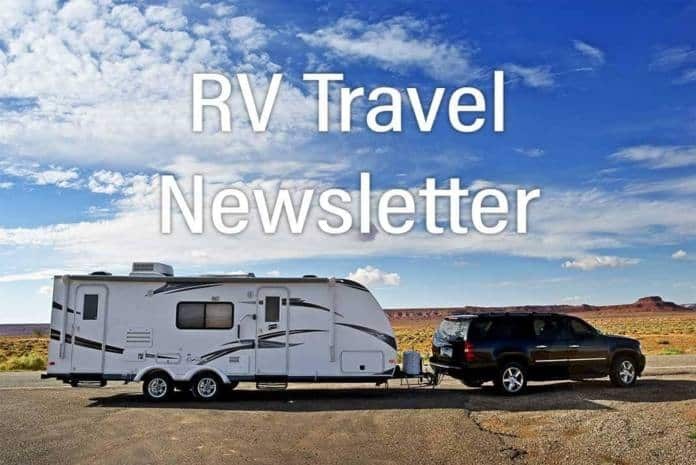 ADVERTISE on RVtravel.com and/or in this newsletter. Contact Chuck Woodbury at Chuck(at)RVtravel.com. About the RVtravel.com editor Chuck Woodbury has explored America by RV for three decades. In the ’90s he published the quirky travel newspaper Out West, and was an “on the road” writer for the New York Times Syndicate. His book, “The Best from Out West” is available at Amazon.com. Woodbury’s RVing adventures have been profiled on ABC News, CNN, NBC’s Today Show, and in People Magazine, USA Today and in hundreds of newspapers. He is the host of the Better Business Bureau DVD “Buying a Recreational Vehicle,” the definitive guide to purchasing an RV the right way. Everything in this newsletter is true to the best of our knowledge. But we occasionally get something wrong. We’re just human! So don’t go spending $10,000 on something we said was good simply because we said so, or fixing something according to what we suggested (check with your own technician first). Maybe we made a mistake. Tips and/or comments in this newsletter are those of the authors and may not reflect the views of RVtravel.com or this newsletter. Our offices are located at 610 5th Ave. S, Suite F, Edmonds, WA 98020. This website utilizes some advertising services. Sometimes we are paid if you click one of those links and purchase a product or service. Regardless of this potential revenue, unless stated otherwise, we only recommend products or services we believe provide value to our readers. Amazon and the Amazon logo are trademarks of Amazon.com, Inc . RVtravel.com is a participant in the Amazon Services LLC Associates Program, an affiliate advertising program designed to provide a means for sites to earn advertising fees by advertising and linking to Amazon.com. Just a quick comment about my latest MH purchase. I would highly recommend National Indoor RV in the Atlanta area. I have never been treated so good after the sale with service. They would get me in with little or no notice. Most dealers seem to ignore you after the sale, not them. After reading the recent article about the nightmares of getting a lemon RV we were leary about buying new. But “knock on wood”, we have been very happy with our 2017 Forest River FR3 we purchased in December. We made the 1000+ mile trip to south FL with no problems. Everything works and its mostly us figuring things out. Colerain RV in Indianapolis were great to work with and said they even schedule a 30 day service visit to take care of any issues. So far so good! Only been a subscriber for a relatively short time. I really enjoy reading the information available. I see several places for comments, but I was looking to see if you have a ‘tips’ section from your readers that is unrelated to posted stories. I find my best help is usually from people that have been there, rather than documentaries. Sorta like the old ‘Dear Heloise’ columns. (showing my age). Simple ideas, hints, tips, and small DIY items are always valued. Our 2nd motorhome is an Allegro Breeze 32 BR by Tiffin that we bought new in Dec. 2014. In our 2 year period we have had both rooftop A/C units replaced, shipped for free and installation paid for by Tiffin. In December Tiffin shipped a whole new dinette seating system as the original material (seat covering) started to decompose. This was also replaced for free, shipping and installation at a RV Repair of my choice paid by Tiffin. Now that is a manufacturer that stands behind its product and warranty. Jerry, Tiffin has an excellent reputation. That’s due to a large degree because owner Bob Tiffin is an RVer himself and understands and appreciates the lifestyle. He also believes if you build an RV you should build it well and make sure things are fixed if they are broken. I seldom hear a complaint about Tiffin, mostly praise from owners. If you are looking for quality in a B+, look at Phoenix Cruiser. They don’t begin to build until they have your specific order, and each one is made with care and attention to quality and detail. I’ve had mostly questions rather than issues, but when there was an issue, it was resolved quickly. The follow-up help is excellent. Any time I am in the area, I stop by and they do a “once-over” and tweak anything that needs it. I cannot say enough good things about Phoenix Cruiser quality and service. Have a Tiffin RV and while we had a few very minor problems they were promptly taken care of by the dealer. If a visit to Red Bay is necessary the service there is tremendous and very reasonable. With regard to your weekly letter and specifically RV quality, I’ve always said whether RV quality of life in general….there will be problems but it’s how you handle it that marks the difference. I.E. : I’ve had several problems with my 2002 TIFFIN but Bob Tiffin and his staff have handled everything admirably. I have zero complaints. Bob TIFFIN has re-written the book on customer service. C. W. McCall recorded “Convoy” (not Convey…). We’ve been mostly happy with our 2015 Tiffin Phaeton, although it’s not been problem free. To the point of fixing the quality issues, that will only happen when some new entrant comes in and disrupts the industry, much like the Japanese car makers did to the auto industry in the 70s. So we need someone who understands quality manufacturing to come along and offer quality products at reasonable prices. I also hope that you keep the heat on the manufacturers lack of quality and dealers follow up. It is absurd that RV purchasers put up with the poor quality and amount of time it takes to get an RV repaired. These same RV purchasers would never put up with this treatment from the automotive industry. Thanks for your efforts in bringing these problems to the forefront and hope new rv purchasers read your magazine before purchasing. I’d like to award an “Attaboy” to you. Your news letter is a joy to read every Saturday morning with my coffee. Your observations on coach quality I feel are spot on. I retired from the USAF & Cessna Aircraft so I’ve been spoiled by good engineering & construction. I feel the quality should go in before the name goes on. I also believe your voice should have a wider audience. I’m going to take every opportunity I can to promote your news letter through my contacts on Facebook & other social media sites. Please keep up the good work. Was especially glad to hear your positive opinion of the Ambition. We have visited their plant , liked what we saw. We also have friends who own. lUXE and are very sarisfied. I have a 2014 Tiffin Phaeton 36 GH which was not without some problems . All the issues were taken care of by Tiffin (a trip to Red Bay) or by a dealer. I am very happy with my purchase and would purchase another product from them and would recommend them to RVer’s looking for a Motor Home. “Don’t Stop Now” !! Hello Chuck; I am re-enthused to see your comments regarding RV quality or the lack thereof,. and the seeming diss-regard for customer satisfaction by dealers and the near industry monopoly of manufacturers. Please, do not lessen your efforts to inform as many as possible of the current rights and wrongs that currently exist. I and I’m certain many other longtime RV owners would willingly offer to you, the benefit of our “Hands-On” experience (I started in 1962) were you simply to ask. I look forward to hearing from you. Keep up the good work !! Happy with my RV AND the after sale service IF you go to the manufacturer in Red Bay, Alabama. I have a 2008 Tiffin Phaeton. Small issues here or there, but we’ve been able to fix most ourselves.